Tata SIA Airlines Limited, operating as Vistara, is an Indian domestic airline based in Gurgram with its hub at Indira Gandhi International Airport, New Delhi. The carrier, a joint venture between Tata Sons and Singapore Airlines, commenced operations on 9 January, 2015 with its inaugural flight between Delhi and Mumbai. Vistara - On Time, Low Fares, Courteous, Hassle-Free, Full-Cost Airlines, Online Flight Ticket Bookings India, Discount Airfares, Domestic Airline Tickets India. Vistara offers affordable, on-time and hassle-free operation at the best possible fares! Vistara operates on a fleet of 16 Airbus. 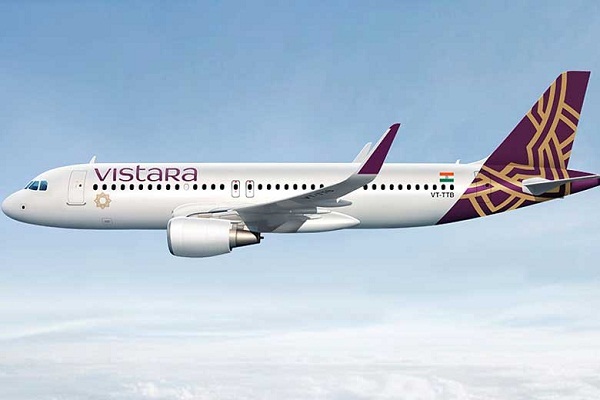 Vistara flies to 21 domestic destinations in India. Being a full cost carrier, Vistara offers three distinct cabin classes to provide a personalized and seamless service. With these cabin classes configuration the A320-200 can seat a total of 148 passengers in all, which include 16 Business Class seats, 36 Premium Economy seats and 96 Economy seats. Business Class features ultra-comfortable seats, extendable leg rest, foot rest and head rest. Passengers flying Business Class enjoy dedicated check in counters, priority security check and boarding, lounge access, choice of leading newspapers, special dining experience with food served in bone china tableware. Passengers with special dietary requirements can place their order for special meals upto 6 hours before departure. Business Class seats come with personal electronic devices or Samsung Tab S 10.5” in the name of in-flight entertainment. Premium Economy passengers enjoy 20% more leg room than regular Economy, personal coat hook, dedicated check in counters, separate boarding lane, priority baggage handling and a wide menu of food to choose from. Economy passengers enjoy finely tailored genuine leather upholstery, comfortable seats which put other airlines’ economy seats to shame and passengers also enjoy complimentary selection of food and beverage. Book tickets for 10 travellers or more with Vistara Airlines by FareHawker flight Group Booking desk. We offer Vistara Airlines group fare facility for all travel portal, travel agencies, corporate & tour operator. Our ex-airliner team members are expert in handling small or large segment of Group Bookings. Vistara Airlines Flight Lowest Group Fare - Buy Group flight tickets with FareHawker for booking domestic airlines group tickets on discounted fare. We are the largest consolidator for Group Air tickets in India. How to book Group Tickets in Vistara Flight ? Any traveller, corporate, travel agency or individual can directly mail to FareHawker Group Desk team by asking for Vistara Airlines flight group fare. Our group booking expert will get back to you on the same trail within 4 hours. Air ticket booking available at lowest airfare for Vistara Airlines flights at affordable prices at FareHawker. Vistara flight online booking - Book Vistara Airline ticket online at lowest air fare at FareHawker. Get best offer for Vistara Airlines, the full-cost airline flying throughout India. Book Vistara Airline tickets with FareHawker as we offer the best-in-class fare options for all types of airline bookings. Our dedicated ex-airliner team with their in-depth industry knowledge offers you the cheapest possible fares for domestic as well as international travel. We take pride in our relationship with the airline partners and it is this relationship that allows us to offer you great travel solutions. We are here not only to find the best flights at cheap airfares but also to offer you consolidated travel services so you enjoy a seamless travel experience. Visit Vistara FAQ for all related queries. Terms and condition of FareHawker and Vistara apply.